Reading and share top 20 famous quotes and sayings about Childhood Fears by famous authors and people. 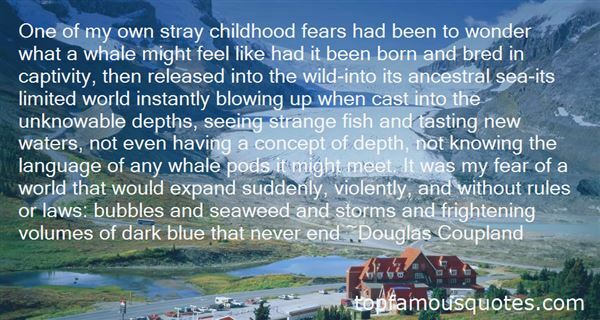 Browse top 20 famous quotes and sayings about Childhood Fears by most favorite authors. 1. "One of my own stray childhood fears had been to wonder what a whale might feel like had it been born and bred in captivity, then released into the wild-into its ancestral sea-its limited world instantly blowing up when cast into the unknowable depths, seeing strange fish and tasting new waters, not even having a concept of depth, not knowing the language of any whale pods it might meet. It was my fear of a world that would expand suddenly, violently, and without rules or laws: bubbles and seaweed and storms and frightening volumes of dark blue that never end"
2. "If we truly detach from our childhood and abandon our inherent romanticism, then we shred any bit of humanity left in us." 3. "One of the universal fears of childhood is the fear of not having value in the eyes of the people whom we admire so much." 4. "Man loves to construct and lay down roads, no question about it. But why is he so passionately fond of destruction and chaos? [...] Isn't man so passionately fond of destruction and chaos (and there's no disputing that he's sometimes very fond of them, that really is the case) that he himself instinctively fears achieving his goal and completing the building in the course of erection? How do you know - perhaps he only likes the building from a distance and not at all at close quarters; perhaps he only likes building it and not living in it [...]"
5. "I remember at one point starting a goofy story about a childhood field trip here, and I saw her eyes go blank, and I got secretly furious, spent ten minutes just winding myself up – because at this point of our marriage, I was so used to being angry with her, it felt almost enjoyable, like gnawing on a cuticle: You know you should stop, that it doesn't really feel as good as you think, but you can't quit grinding away." 6. "I WAS born a slave; but I never knew it till six years of happy childhood had passed away." 7. "All people cross the line from childhood to adulthood with a secondhand opinion of who they are. Without any questioning, we take as truth whatever our parents and other influentials have said about us during our childhood, whether these messages are communicated verbally, physically, or silently." 8. "I felt like lying down by the side of the trail and remembering it all. The woods do that to you, they always look familiar, long lost, like the face of a long-dead relative, like an old dream, like a piece of forgotten song drifting across the water, most of all like golden eternities of past childhood or past manhood and all the living and the dying and the heartbreak that went on a million years ago and the clouds as they pass overhead seem to testify (by their own lonesome familiarity) to this feeling." 9. "India has known the innocence and insouciance of childhood, the passionand abandon of youth, and the ripe wisdom of maturity that comes from long experience of pain and pleasure; and over and over a gain she has renewed her childhood and youth and age"
10. "Dad has, and had, a deservedly glowing reputation. However, this belief in 'reputation first' seems to have given rise to his fears of what might be rumored after his death." 11. "But childhood prolonged, cannot remain a fairyland. It becomes a hell." 12. "I hope that I state your case fairly: One of my great fears is misrepresenting you, even to myself, now that you are not here to set me right. 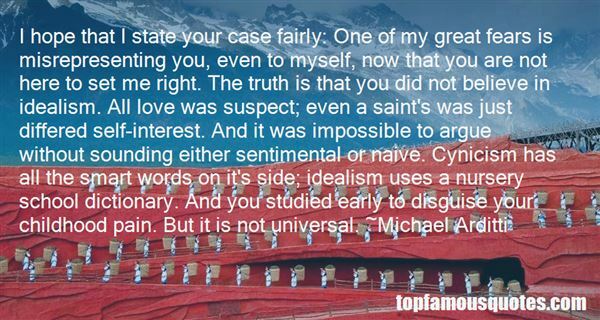 The truth is that you did not believe in idealism. All love was suspect; even a saint's was just differed self-interest. And it was impossible to argue without sounding either sentimental or naive. Cynicism has all the smart words on it's side; idealism uses a nursery school dictionary. And you studied early to disguise your childhood pain. But it is not universal." 13. 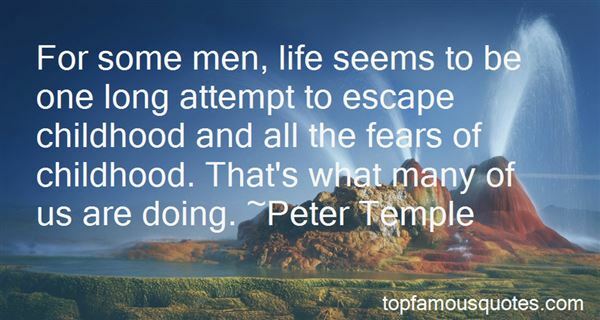 "For some men, life seems to be one long attempt to escape childhood and all the fears of childhood. That's what many of us are doing." 14. "I am among the few who continue to draw after childhood is ended, continuing and perfecting childhood drawing - without the traditional interruption of academic training." 15. "The past is not a peaceful landscape lying there behind me, a country in which I can stroll wherever I please, and will gradually show me all its secret hills and dales. As I was moving forward, so it was crumbling. Most of the wreckage that can be seen is colourless, distorted, frozen: its meaning escapes me... all that's left is a skeleton. I shall never find my plans again, my hopes and fears - I shall not find myself." 16. "Remember, childhood only lasts 10-12 years. There's a lot that has to be squeezed in to make for a lifetime of happy memories. ?" 17. "I saw that it was all over, put away in a box like a doll no longer cared for, the magical intimacy of our childhood together"
18. "Psychotherapy is what God has been secretly doing for centuries by other names; that is, he searches through our personal history and heals what needs to be healed - the wounds of childhood or our own self-inflicted wounds." 19. "Fear not the man who fears God, but the one who fears you." 20. "Infirm of purpose! Give me the daggers: the sleeping and the dead are but as pictures: ‘tis the eye of childhood that fears a painted devil"
With thousands of roads before us that lead nowhere, going in circles. There really are only two roads we will either travel, one going to heaven, or the other to hell."